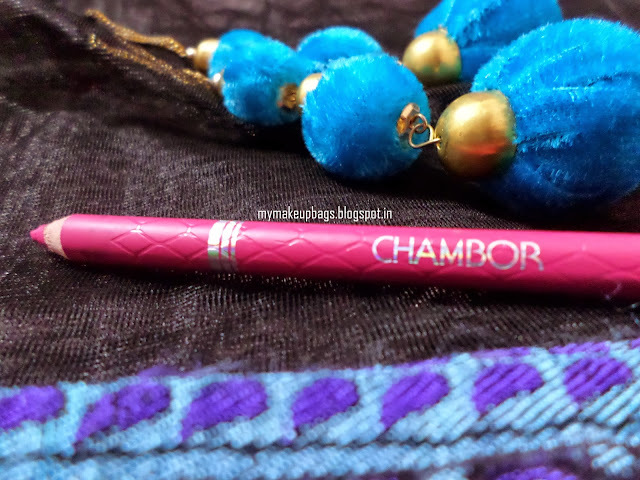 TODAY I AM DOING A REVIEW OF CHAMBOR VELVETTE TOUCH LIP LINER PENCIL. WELL! AS FOR ME, THIS IS A PRODUCT WORTH SPENDING ON. I ACTUALLY SAW ONE OF MY CLOSE FRIENDS WEARING IT AND I SERIOUSLY FELL IN LOVE WITH THE COLOR AND I ALSO ACKNOWLEDGE THE FACT THAT THE SHADE WAS LOOKING VERY NICE ON MY FRIEND. AND HENCE, OUT OF LOVE AND TINY WINY BIT OF JEALOUSY, I DECIDED THAT I HAD TO HAVE IT. BUT AS I AM A SMALL TOWN GIRL AND LIVE IN A SMALL TOWN WORLD, I COULD NOT GET HOLD OF CHAMBOR ANYWHERE IN MY TOWN. I ALSO WENT ON LINE BUT COULDN'T FIND THE PARTICULAR SHADE, SO, FINALLY I HAD TO GO TO SILIGURI (WHICH IS A BIGGER TOWN THAN MINE SOME 65 KMS FAR) AND LANDED UP IN SHOPPER'S STOP AND THERE IT WAS STANDING PROUDLY ON THE TOP OF THE COUNTER LOOKING AT ME. THE PENCIL LOOKS PRETTY AND ITS JACKET IS SAME AS THE COLOR OF THE PENCIL AND IT HAS LITTLE SCALES ON IT THAT GIVES IT A LUXURIOUS LOOK. THE GOOD THING ABOUT THIS LIP LINER IS THAT YOU CAN USE IT AS A LIPSTICK AS WELL. THAT'S WHAT MY FRIEND DOES, SHE USES IT BOTH AS A LIP LINER AND FILLS IT UP OVER ALL HER LIPS LIKE A LIPSTICK. WELL I DID TRY IT AND THE COLOR LOOKED TOO BRIGHT AND NEONY ON ME. I LOVED THE LINER. IT DOES WHAT IT IS SUPPOSED TO DO WELL. 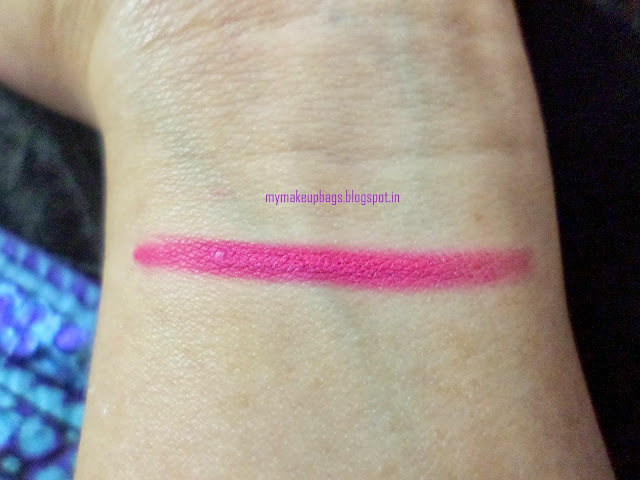 I THINK IT IS A LITTLE PRICEY FOR ME BUT I THINK IT IS COST EFFECTIVE RATHER THAN COSTLY BECAUSE I SOMEHOW FEEL THAT IT WILL LAST ME QUITE LONG AS THE PENCIL IS EASY TO GLIDE AND WITH GOOD PIGMENTATION SO THAT THERE IS NO WASTAGE IN SHARPENING THE PENCIL AGAIN AND AGAIN.